John Fullerton addresses over fifty participants at the recent kickoff for the Hub in Denver. The existing economy is not serving us well. The middle class is stagnating and ordinary people struggle to make ends meet. At the same time, we face ecological crises from climate change to species loss and toxic loading in our bodies. We feel powerless in the face of business-as-usual economic models and global corporate dominance. We need an economy that delivers solutions to these crises, answers people’s fears and speaks to our aspirations. 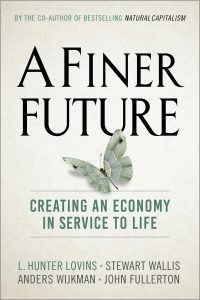 The answer is to replace the narrative of unfettered markets and austerity that now dominates global economic policy with a “regenerative” economic vision that delivers shared prosperity on a healthy planet and leverages the power of entrepreneurs to innovate. This needs to be implemented where people live, in the watersheds and communities of our homes. Natural Capitalism Solutions (NCS) is bringing together citizens, organizations and communities in the greater Denver/ Boulder/ Fort Collins area (representing 90 percent of Colorado’s economy) to form the Colorado Regenerative Hub. Jointly chaired by NCS President, Hunter Lovins and Mark Williams, a tech entrepreneur and Iraqi War veteran, the Hub will demonstrate that a regenerative economy is already emerging in Colorado. If consciously stewarded, this economy can be more ecologically sustainable and deliver greater wellbeing to all. This is one of seven inaugural Hubs created by the Regenerative Communities Network. Storytelling and publicity: We will encourage adoption of regenerative practices using traditional PR and a vigorous social media campaign. The conventional wisdom holds that Colorado is an extractive industry economy. Our initial research shows that such industries as clean tech, natural foods and outdoor industries represent a far larger source of revenue and jobs than oil, gas, coal, mining, industrial agriculture, etc. 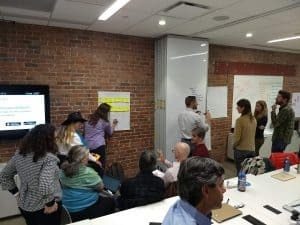 The Hub will place articles and conduct extensive outreach to help Coloradans realize that a more regenerative economy is already emerging, and provide information about what they can do to strengthen it. Policy implementation: Embed this thinking into local and state economic policies. Hub leadership is scheduling meetings with the newly elected Governor and various agency heads to bring these principles into state government. Research: Demonstrate that the existing extractive economy is actually a small contributor to Colorado prosperity relative to the growing number of regenerative industries. Economic mapping: Dr. Elizabeth Walsh of the University of Colorado, Denver will guide a detailed mapping of the Colorado region to identify and engage groups already pursuing regenerative activity and enlist them into the transformation effort. Sustainable and Regenerative business guidelines: NCS will make its extensive businesses sustainability materials available to small businesses and others. Regenerative Investment Model: NCS will develop an incubator/accelerator for local regenerative companies and help them find the funding they need to scale. Two of five workshops on the second day of the kickoff event: setting the Hub narrative workshop, and regenerative agriculture practices in Colorado workshop. 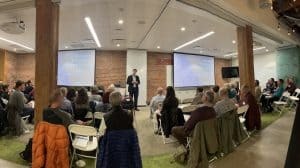 NCS directed a two-day event with more than 50 people from the Alliance Center, B-Corp Colorado, Savory Institute, Rocky Mountain Farmers Union, City Craft Ventures (a regenerative developer), Regis University, local government and others. These and many other groups agreed to become partners in the effort. This was the first of many such gatherings. Stay tuned to follow more Colorado Regenerative Hub developments throughout 2019 on this site plus NCS’ Facebook, Twitter, and YouTube accounts.